Go to Config Generator page, choose Linux and choose your preferred options. Click on any archive format. Save the downloaded archive file somewhere, say in ~/.airvpn. Extract it. Five files should be extracted. Try to make sure nobody but you can read the file user.key, because that one is secret. 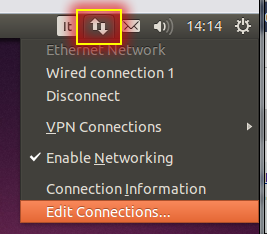 Install the package named network-manager-openvpn-gnome, which is a plugin to NetworkManager handling OpenVPN connections. The install will automatically include all needed packages, like openvpn etc. Click Add, choose Import a saved VPN configuration, click Create... and choose a .ovpn file extracted from files generated by our Config Generator. The imported information is displayed. Click Save... and close the NetworkManager Connections editor. From now on, the imported connections are showed under VPN Connections menu. Click it to connect. You will have to manually enter the VPN in in 14.04. First download and extract your keys and opvn file from airvpn. Remember where these are, probably in downloads. 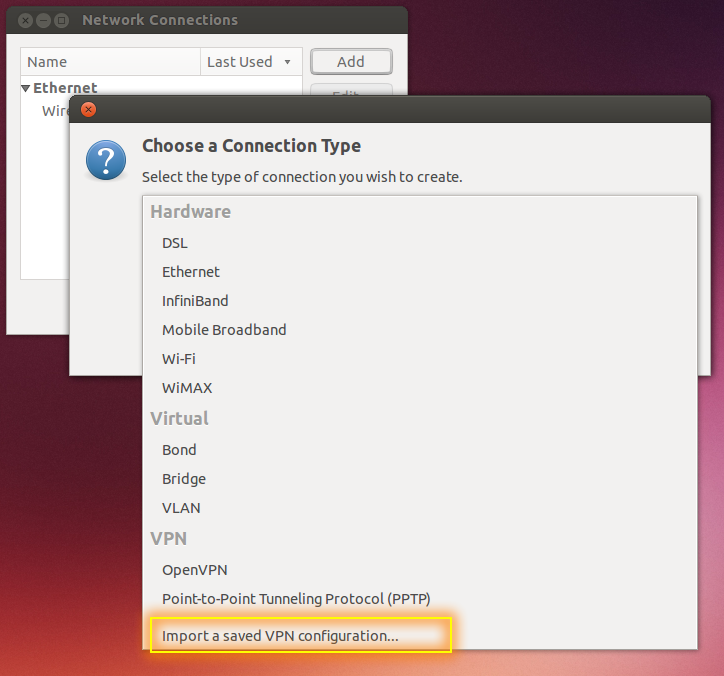 Now go to network manager in the tray and choose vpn connections -> configure VPN. A network connections window will open. Click Add, choose Open VPN in the dropdown, click create. Name your connection whatever you want. Now open your opvn file in gedit that you downloaded from Airvpn, it will have the gateway address in it and port number. 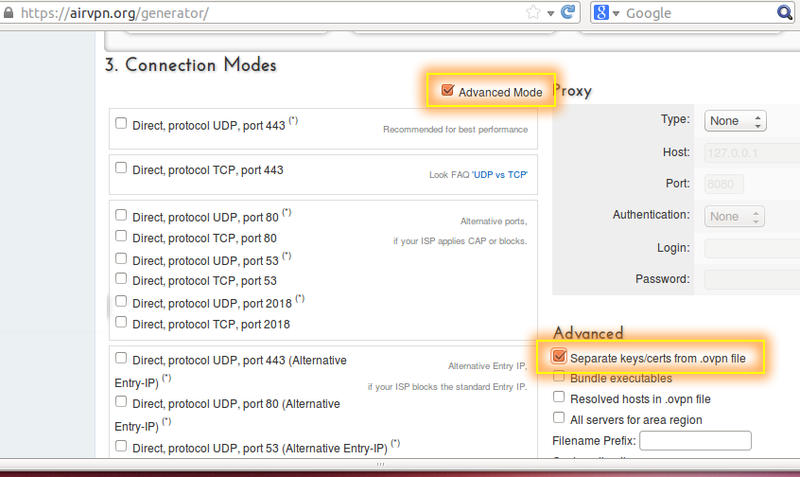 You will see next to the word remote will be the address that you will copy and paste into the Gateway field within your newly created OpenVPN connection. Under Authentication, the type is Certificates (TLS). User Certificate, CA Certificate and private key will be the files you downloaded from Airvpn. Click the folder icon next to the entry field and browse to their download location. Now click the advanced button. Now click the security tab, choose AES-256-CBC for the cipher. Now click the TLS Authentication tab, tick Use additional TLS authentication. Under the key file entry browse to the dowloaded ta.key you downloaded from Airvpn. Change Key direction to 1 and click OK. Your entry should now be in the Network connections window under the VPN category. Click close. Now choose the vpn connection in network manager and Voila you should connect. Another approach, open the package manager and type in vpn to the search bar. When it comes back, I tagged anything that said it would be useful to complete a vpn connection, in both network manager and otherwise, and supporting packages. Rebooted and got the usual import dialogue as an option in the pulldown menu. Not elegant, but it worked for me. If someone could nail down which missing package invokes the import menu, it would simplify all this but I do not know nor have time to chase it. Bug in config manager: ADVANCED MODE doesn' t work after selecting linux. Using chrome. It was notscript for chrome blocking the interface.